PREVIOUSLY, INDUSTRIES “put out” jobs to workers, giving them raw materials and coming around to collect the results. Industrialization centralized this whole process. According to one history, the number of handloom weavers in Lancashire dropped from 240,000 in 1820 to only 188,000 by 1835. Their wages decreased from more than three shillings to just over two for a piece of calico. By 1861 only 7,000 hand weavers remained. The number of powerlooms increased from 2,400 to 400,000 in the same time period. Centralizing work meant centralizing workers. London grew from housing one-fifth of Britain’s population in 1800 to half the population by 1850. In New York City, population doubled every decade from 1800 to 1880. Today the word “LUDDITE” describes someone who opposes advances in computing technology. Two hundred years ago, it was used for textile workers who smashed machines that were displacing them. The movement began with a series of disturbances in 1811 in northern England. Luddites took their name from the apocryphal figure Ned Ludd, who had supposedly broken a knitting frame after a superior admonished him. ARTHUR GUINNESS (see “Godless capitalists?” pp. 33–36) not only produced a line of brewers, he also sired a missionary line, the “Guinnesses for God.” Arthur’s grandson Henry Grattan Guinness became a famed evangelical orator (and, ironically, a teetotaler). He evangelized throughout Britain and wrote books on biblical prophecy. Henry’s daughter Geraldine married the son of Hudson Taylor, a famous missionary to China, and wrote Taylor’s biography. Modern apologist Os Guinness, carried out of China in a basket on a pole at the age of two by his missionary parents to escape the approaching Japanese army, is Henry’s great-grandson. NINETY MEMBERS of the communal society the Christian Brethren boarded the steamboat Megiddo in 1901 and set off to evangelize cities along the Mississippi and Ohio Rivers. The members lived in family groups and supported themselves by making and selling crocheted goods, taking odd jobs in ports, collecting rent from properties the members owned in cities along the route, and charging the curious public admission for tours. After two years, navigational problems drove the group, now called the “Megiddo Mission,” onto land. In early 1904, they settled in Rochester, New York, where the Megiddo Church functions today. 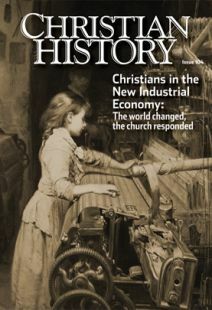 Christian History Timeline: What Happened when the World Transformed?